In January 1902, the Ohio Democratic Party opened its first permanent state headquarters in Columbus. Ten years later, Ohio voted for Woodrow Wilson (1856-1924), the first Democratic president in the 20th century and the 28th president of the United States. 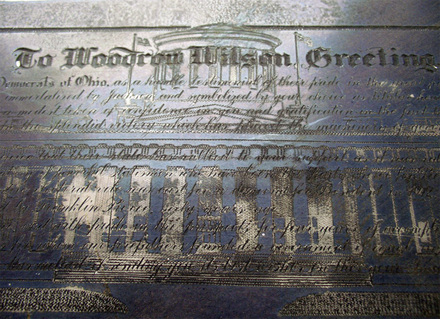 The Graphic Arts Collection holds the engraved printing plate for a certificate of greeting to President Wilson from the Democrats of Ohio, “as a humble testament of their pride in the great party of principle founded by Jefferson, immortalized by Jackson, and symbolized by your choice as titular head and dignified (?) 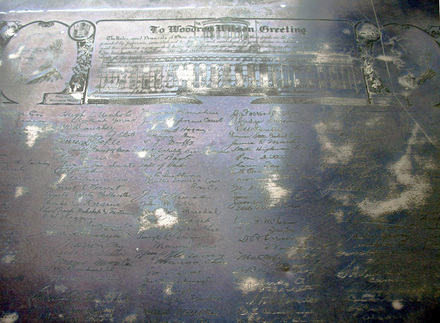 bearer, and this greeting is a modest token of confidence in you…” The plate is not dated but we believe it to be ca. 1912/1913.